Nuvair is a worldwide leader in supplying offshore and inland low- and high-pressure nitrox generating compressors to the commercial diving industry. We have small turnkey solutions and can custom build designs for your boat, barge or shop that meet your specific needs. Our container packages for larger operations can incorporate low pressure, high pressure and nitrox compressors into a connex container that can be moved from job to job. Big or small, Nuvair is ready to take on your commercial diving compressor needs. Significant savings of diver time and other critical factors. 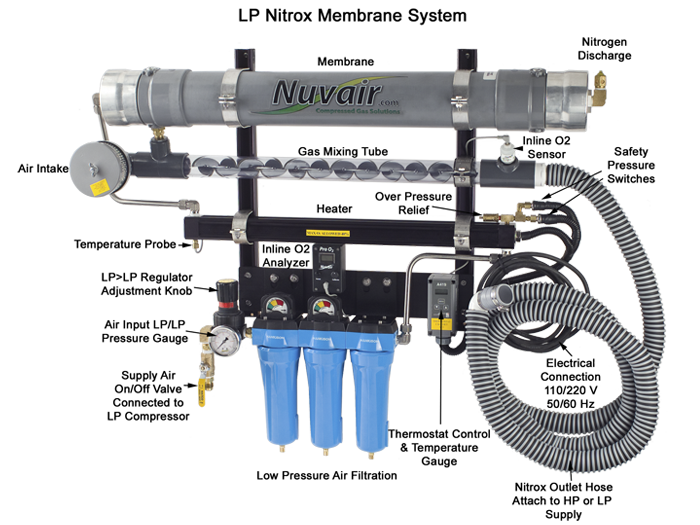 Nuvair's patented semi-permeable membrane nitrox generation system can be purchased as a standalone product (for integration into an existing air compressor system) or in a complete turnkey system for low pressure (LP) or high pressure (HP) nitrox production. Any desired O2 percentage mix, from 21% to 40%—including commonly used EAN mixtures of 32% and 36%—can be dialed-in as needed in real time for continuous supply to divers or for filling tanks. For commercial surface supply dive operations, the O2 percentage can be easily changed for different working depths during the dive for constantly accurate nitrox mix delivery. Nuvair breathing air systems are economical, easy to operate, and highly reliable whether filling HP tanks or supplying divers with a continuous and dynamic LP nitrox supply. Our nitrox breathing experts will assist you in choosing streamlined turnkey systems based on your use, CFM requirements, pressure and power needs for commercial or recreational diving. All packages are ready to operate upon delivery. Highly customized systems are available for any oxygen enriched nitrox application across all market sectors including technology, science, offshore vessels and government. In diving terminology, “nitrox” is any mixture of nitrogen and oxygen when these two gases represent the major components of the gas mix. Decreasing the amount of nitrogen in the breathing gas mixture reduces the amount of nitrogen absorbed by divers thereby increasing their no decompression (NO DECO) times and decreasing lengths of surface intervals (SI). Nitrogen is replaced with oxygen in nitrox breathing gases. Gas mixtures containing more than trace levels of other gases normally found in air (other than nitrogen and oxygen) are not considered nitrox. Nitrox mixes that are hyperoxic (containing more than 21% oxygen) use a variety of names and acronyms, including: Enriched Air (EA), Enriched Air Nitrox (EAN or EANx), Oxygen Enriched Air (OEA), and nitrox (Nx). It is customary to refer to specific EAN blends by including the percentage of oxygen in the descriptive name, i.e. nitrox 36% or EANx36. Nitrox is used extensively in recreational diving, technical diving, and the commercial diving industry. It is also widely used by public safety professionals. Military divers have successfully used EAN for over 60 years. Today, enriched air recreational divers enjoy the many benefits of diving with nitrox instead of air, but because of the expense and skill level required for nitrox production, enriched air gas can be difficult to find, limited to only a few specialized facilities. The recent introduction of “denitrogenating” air membranes has changed all this. The production and processing of nitrox and tri-mix has now become safe, practical and easy. 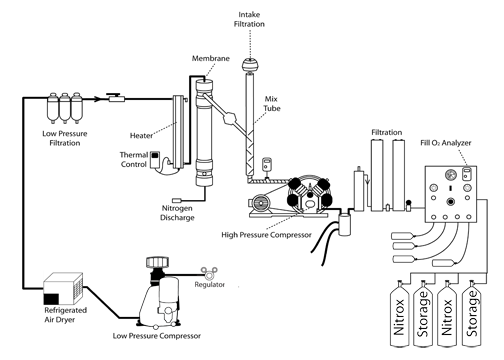 Scuba training agencies now promote nitrox as the gas of choice for extending recreational scuba dive times. Diving is now an intensely competitive industry and any technology that can offer a dive shop owner an advantage can only be an asset. Nitrox membrane systems allow the filling of nitrox tanks at the same rate as the filling of standard air tanks. No more expensive oxygen cylinders, no need for any booster pumps, and no more worries that your dive shop will go up with a bang because of an inadvertent partial pressure blending mistake. With our patented nitrox producing membrane systems, Nuvair offers an affordable and reliable way to produce nitrox as cheap and as fast as your HP compressor can deliver air. Seize this opportunity! Be at the forefront of dive technology and ahead of your competition. Semi-permeable membrane systems have dramatically changed the production of enriched air nitrox. The system produces any blend of nitrox from 21% to 40% oxygen by denitrogenating (removing nitrogen) breathing air instead of enriching air with pure high-pressure oxygen. The denitrogenated air is produced by the low-pressure membrane system which in turn feeds a high-pressure compressor, pumping enriched air nitrox directly into an individual scuba cylinder or a bank of nitrox gas storage tanks. Gone are the hazards related to handling, refilling, delivery and proper storage of pure oxygen cylinders. Our complete turnkey nitrox generation system allows for a preset mix (21-40%) or real time, dynamic adjustments as you go by simply adjusting the input pressure to get the desired oxygen percentage output. Mix accurately to within 0.1% oxygen content—the mix is monitored in real time by the included LCD oxygen analyzer. Only one hour of operator training is required. Operators DO NOT require Gas Blender Certification! Installation time: About two hours. Enjoy decreased risk, liability and insurance premiums because partial pressure blending of tanks with 100% oxygen is eliminated! Dive boats and buildings where pure oxygen is used are difficult to insure and have extra fire safety mandates to contend with. No special oxygen cleaning procedures or dedicated oxygen clean tanks or equipment is required as the filling procedure never involves gas mixtures containing more than 40% oxygen (EANx40). There is no need for time consuming and complicated blending calculations. Fill nitrox tanks as fast as your HP compressor can work. When using pure oxygen tanks for blending, the last 500 psi of the oxygen tank is often inaccessible and unusable. Our system offers high-volume output with no wasted resources, no travel to air fill stations and no waiting for fills. You are in complete control of your air quality. Routine maintenance, like changing filters, is easy. The membrane system operates on CGA Grade E or Grade D air. Membranes do not have mechanical wear or chemical deterioration. If correctly utilized, membrane components last for over 20 years. The system will continuously produce from 21% to 40% oxygen. Portable systems are built to move safely from vessel, to vehicle, to shop—wherever nitrox is required. Seaworthy dock boxes and custom cabinets are available. The HP compressor part of the system can be used to fill air or Nitrox tanks with no adjustments or switch to just LP feed. The membrane system requires a source of clean, pressurized, and heated air for gas separation. The two most common sources are HP air storage tanks or an LP compressor. The air must be properly filtered to CGA Grade D or E air quality prior to entering the membrane system so it will not damage or plug the semi-permeable membrane fibers. Nuvair utilizes high-quality input pressure air regulators to adjust for maximum allowable membrane supply pressures, which are 5,000 psi for HP supply or 250 psi for LP supply. Incoming air is heated to a temperature that provides stability over a wide range of ambient conditions and is optimal for membrane permeation. The heated air enters the membrane, which is made up of thousands of miniature hollow fibers running axially through a cylindrical housing. The semi-permeable fiber walls of the membrane allow different gases to move through them (or permeate) at different speeds. The resulting gas mixture is known as the “permeate.” As air flows through the hollow fibers, oxygen molecules permeate faster than nitrogen, producing permeate with an oxygen content greater than that in air. The gas that reaches the end of the hollow fibers without permeating is almost entirely nitrogen and is discharged from the system. After passing through the membrane, the flow rate of the discharged nitrogen gas establishes the oxygen percentage in the permeate. It is factory set using a fixed orifice so the oxygen content of the enriched air output is approximately 42% oxygen under all operating conditions. The permeate is a concentrated mixture that must be diluted with additional air prior to delivery to the nitrox compressor. The gas exits the membrane at ambient (or slightly negative) pressure and travels into the mixing tube where it blends homogeneously with filtered outside air. The amount of dilution and final oxygen content is set by adjusting the input pressure regulator. As pressure is increased, permeate flow increases, air intake flow decreases, and a higher percentage nitrox is produced. When pressure is decreased, permeate flow decreases, air intake flow increases, and a lower oxygen nitrox content is produced. This relationship between permeate flow and air flow exists because the total of these two flow rates will always equal the intake flow rate demanded by the nitrox compressor. The resulting nitrox mixture is analyzed for O2% by oxygen sensors before delivery to the nitrox compressor and again at the point of final nitrox delivery. The Nuvair denitrogenating membrane can operate without a heater if the intake air temperature supplied by a low-pressure compressor is at 59°F (15°C) or warmer. But for maximum efficiency, intake air should be at ~104°F (~40°C). An integrated heater provides this optimal temperature and stability, which means that there will be very little temperature fluctuation resulting in a stable O2% flux level throughout the course of the day. Compressing air results in moisture condensate. During the compression process, moisture is removed with separators, then the air travels through the refrigerated air dryer where the dew point is brought down to just above freezing. Remaining moisture is then removed and the air is filtered. When air is warmed back up, we are sure that moisture will not drop out of the air inside the membrane, which would otherwise result in a shortened membrane lifespan. The Nuvair membrane is efficient and durable with an expected 20- to 25-year service life depending on use. Nuvair offers a 36-month limited warranty on nitrox membranes. The increased durability of our membranes comes from the manufacturing process that allows permeation through a special coating on the outside of the plastic tubes in the membrane. Other manufacturers only coat inside the tubes. This outside coating means the fibers will not be damaged as easily with hydrocarbons and oil vapor. The above system diagram shows configuration using HP storage to feed the membrane system. The Nuvair nitrox membrane system can be used with existing compressors equipped with the proper adaptor, pressure output, filtration and air cooling. It is important that the output of the membrane system is sufficient to satisfy the intake requirements of the compressor. Existing high-pressure compressors should run cool, be in good mechanical condition, and should only use the high-performance synthetic lubricant recommended by Nuvair. It is also recommended that any existing machine undergoes a thorough service and oil change before connecting a nitrox generation system. The above system diagram shows a configuration using a LP silent rotary compressor offered by Nuvair to feed the membrane system. The air/nitrox mix can then be fed to a HP compressor to fill HP tanks. The membrane system can be utilized for Trimix production as shown in the diagram above. The Trimix adapter can be installed with the initial system or as an addition later on. 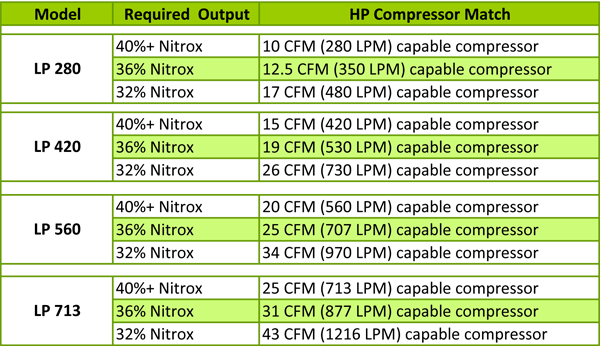 The table below gives examples of some standard HP compressor matches with Nuvair Rotary LP units.